That I am able to raise my little boy in this way. We did not have Playstations, Nintendo's, X-boxes, no video games at all, no 150 channels on cable, no video movies or DVD's, no surround-sound or CD's, no cell phones, no personal computers, no Internet or chat rooms........WE HAD FRIENDS and we went outside and found them! If YOU are one of them. CONGRATULATIONS! 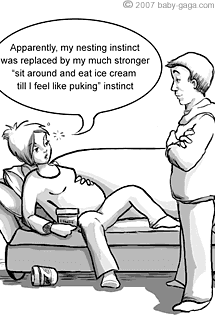 There is seriously more truth to this cartoon than you'll ever know... Let's just say after a rather filling meal at Applebee's, a medium Snicker's Blizzard from Dairy Queen is NOT necessary, or possible for that matter! I'm a little in awe that I am finally in my 3rd Trimester. I'm a mixture of excited and nervous all at the same time. Importantly, I cannot WAIT to start our lives with this little guy. We have so many plans and so many things that we want to share with him. We never thought it would be possible to have him in our lives and feel so humbled and so blessed. At 27 weeks I'm doing well. I haven't had the urge to puke in at least a week so that is progress!! The only issues I have now are dealing with some pelvic pain which walking helps to alleviate and big time trouble sleeping. Between getting up to pee every couple hours, my sleep is very restless. Oh how I love to sleep and how I hate that I cannot! Starting next week, I will be going to the doctor for checkups every 2 weeks. Also next week is our 3d/4d ultrasound which should be fantastic!! I was excited to hear that invitations to my baby shower went out this week. I cannot WAIT for the shower! It is kind of the first time that we'll really have "stuff" to help us get started on getting ready for our little boy. A lot of this is so surreal to me since I never thought I would get this chance. I listened to this song this morning and of course... it made me cry!